If you want some visual stimulation on your next fly-fishing trip, you might want to use a dry fly as your bait. This fly rests on the surface of the water, which means the fish has to actually break the surface to eat it. Not only does it help you get a trout on your line, but it also provides a front-row view of the fish and how it eats. You can see exactly when the fish has taken the bait so you know when you need to reel it in. 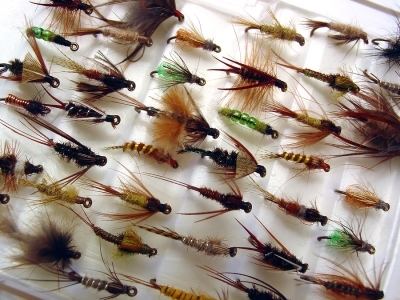 Many experienced fly-fishers prefer to use the nymph bait. Since trout tend to do about 80 percent of their feeding under the water, the nymph bait has a higher likelihood of attracting them to your line than other kinds of bait . As it rests on the bed of the river, it has the chance to catch a larger number of hungry fish. If you choose a streamer as your bait, you should make sure to get a heavier weight of tippet so it can stand up to a fast, aggressive bite from a hungry trout. Streamer bait attracts fish because it looks similar to leaches, minnows, and sculpins. It is up to you to cast the line out and pull it back in in short or long pulls. The better you get at these movements, the likelier you are to catch something good. You might want to try a few different kinds of bait the next time you go to a fly-fishing lodge in Montana. The only way to find your best bait is to spend some time on the water with all three.